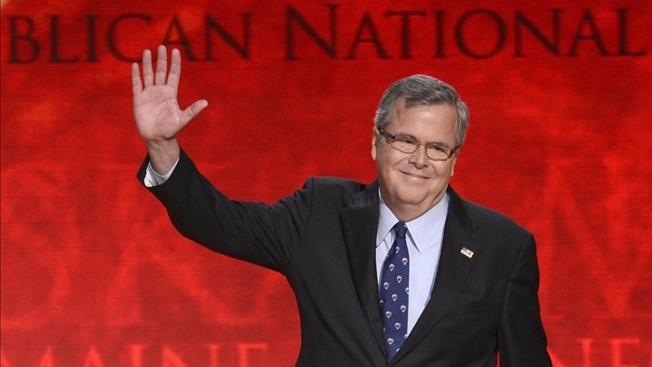 Jeb Bush: Campaign Decision Coming "In Relatively Short Order"
Jeb Bush said Thursday he will make up his mind "in relatively short order" whether to seek the Republican nomination for president in 2016. The former Florida governor will be in New Hampshire this weekend to speak at town hall-style meetings at two businesses and at a GOP event. He will also attend a night event called Politics and Pies and a morning event called Politics and Eggs, he said. "Typical day in New Hampshire, apparently," Bush told reporters Thursday in Jackson, where he attended a bill signing ceremony with Republican Gov. Phil Bryant. Bush said he's not concerned that several other hopefuls are ahead of him in launching their campaigns. "I'm on a journey to kind of measure support," Bush said. "Other people's processes are not really that relevant to me. I'll make up my mind in relatively short order. I'm excited about just the possibility of being in a position to consider it." He said his family supports his exploration of a presidential bid. Christie on Presidential Run: "I Have Not Made This Decision Yet"
"In a campaign, no matter if it's running for governor or running for president or anything else, you've got to go earn it," Bush said. "You've got to go earn people's respect and persuade people that your ideas are better, that you have leadership skills to make it happen. You've got a heart for people. Those are the things that matter. Who's winning, who's losing? Who cares?" The law Bryant signed is based on a program created in Florida when Bush was governor. Mississippi will issue $6,500 vouchers for a small percentage of the state's special education students. Families can use the public money to pay for private school tuition, tutoring or other education services outside the public schools. Mississippi has about 66,500 special-needs students. The new law will create vouchers for 500 students the first year. Over five years, the program will grow to 2,500 students. Rubio Denies Jeb Bush Rift: "We'll Remain Friends"
Bush said he expects the program to boost educational opportunities in Mississippi, where fewer than 25 percent of special education students finish high school. "The schools will start becoming more focused on the challenges of children with learning disabilities and more kids will rise up," Bush said. "I know in Florida when we gave kids choices they didn't have, all schools got better."